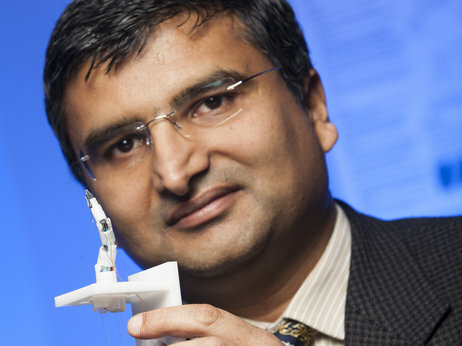 Prof. Jaydev Desai and the Minimally Invasive Neurosurgical Intracranial Robot (NIMIR) prototype. A University of Maryland research collaboration between Professor of Mechanical Engineering Jaydev Desai and his Baltimore-based Medical School colleagues J. Marc Simard and Rao Gullapalli was featured in a story on National Public Radio. The NPR story focused on a robot that Desai and his colleagues are developing to minimize harm to patients during brain surgery. This Minimally Invasive Neurosurgical Intracranial Robot is a worm-like, multi-jointed device about a half-inch wide. The robot can be used while a patient is inside an MRI scanner, allowing the surgeon to look inside a patient's brain without having to open it wide. The project is funded by the National Institutes of Health. Visit the NPR website for the complete story.